Restaurant critic: get out! Is anonymity a thing of the past? With the announcement last week that New York Times editor Sam Sifton has been appointed to take on the role as the paper’s new restaurant critic, the hue and cry was swift: “Everyone knows what he looks like, so how can Sifton get a `true’ read on the restaurants he’ll be reviewing?” NYT executive editor Bill Keller answered that question in the Diner’s Journal blog today, writing, “Read Ruth Reichl’s book about her long stint as the Times restaurant critic, and you learn that despite all her theatrical dress-ups she was often made by the maitre d’hotel.” True enough. 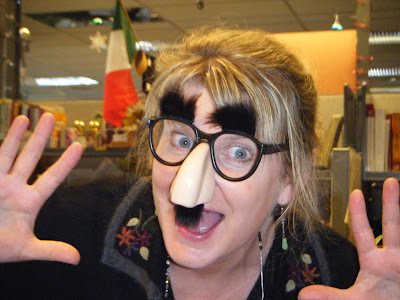 As a restaurant critic of longstanding, I too was occasionally “made” — even when I arrived wearing my favorite disguise. I still contend that during the decade I wrote lead reviews for the Seattle Times, I rarely got a second glance when I walked, unannounced, into a restaurant. Which isn’t to say I was never royally busted (I chronicled my favorite bust in this column on the subject of anonymity). But you’d be surprised how many restaurant folks failed to recognize me when I showed up. And that includes Boat Street Cafe’s Renee Erickson, who was quoted in the Seattle Weekly as having nailed me at her restaurant. “I’ve been fortunate enough to have other restaurateurs in the restaurant when critics have been here, which has blown their cover,” Renee told the Weekly’s Mike Seely in 2006. “People pretty much know who most of them are.” What she didn’t say (though I bet she would if you asked) is that I’d been writing about her and her restaurant for years, and it wasn’t until my third review visit to the new Boat Street that my cover was blown — by the owners of Lark, who had recently sat in front of me on an early morning plane to New York City, go figure. I also recall sitting across from Matt Dillon at his communal table at Sitka & Spruce as he consulted with the folks from Ballard’s as-yet-unopened Snoose Junction. I had great fun listening in and stole the occasional look at the pizzeria’s blueprints while I ate my baby chicken with morels during a review meal. Hilarious. As Le Pichet’s Jim Drohman told Seely, “Once you’ve been in this town long enough, you just get to know the critics. You get to know their faces — you see them at various food-related events and charitable things, and they’ll eat out a lot on their own time. It’s hard to stay secret for very long.” And hey, I’m quick to admit Jim’s been able to pick me out of a lineup for at least a decade, thanks, in no small part, to my adoration of his cookery. Small wonder that when I switched to public blogging in 2008, I chose Le Pichet as the setting for my “coming out” photo. In the age of the Internet, it’s getting harder and harder to maintain any kind of anonymity, no matter who you are or what you do for a living. And these days, with the food blogs and restaurant-centric Web sites like Yelp and Urbanspoon, the notion that “Everyone’s a critic!” rings especially true. So much so that one might rightfully inquire whether anybody really cares whether or not there’s a (paid) restaurant critic in the house. 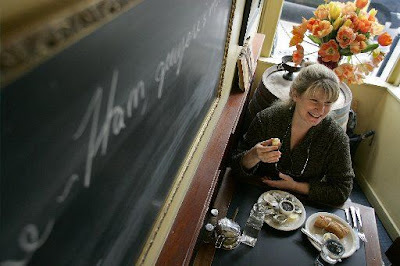 Having waited on or recognized many critics and food scribes during my tenure as a waitress (including the Seattle Times’ John Hinterberger, the P.I.’s late Jonathan Susskind and the New York Times’ Mimi Sheraton, among others), I can tell you that people sat up and took notice when they were in the dining room. And I’d argue the same is true today — though I definitely think it’s a much bigger deal in New York than it is here in Seattle.